Can you imagine my excitement when I discovered that Caloundra has its very own Downtown Street Art Trail! Absolutely true, Caloundra is metamorphosing, like the proverbial butterfly, and emerging as an urban creative hub! How cool is that! Of course, as I have mentioned before, I am definitely no connoisseur when it comes to art, but give me colour, give me vibrancy and imagination and… I'm there in a shot! There are nine street artworks to find, all of which are within a comfortable walking distance of each other. The total Caloundra Street Art trail loop will take you through laneways and back alleys of Caloundra and is approximately 1.7km - an easy Sunday afternoon exploration trip. The nine creative gems on the Caloundra Art Trail, just waiting to be discovered, highlight local history, colourful stories and meaningful expressions by some of the best local and national Australian street artists. Sunshine Coast Council recommend art enthusiasts should start the Art Trail at the Caloundra Regional Gallery, then take a wander up through Lamkin Lane to discover The Pavilion and The Lighthouse murals. Take a stroll up Bulcock Street to the top of the roundabout and then down to the Dingle Wall. On your way back down Bulcock Street, cross the road and turn left into the laneway towards the Transit Centre, where you will find Ma and Pa and to the left, behind you, the Miniature Panthers. Head south along Williamson Lane to discover three other works of art. 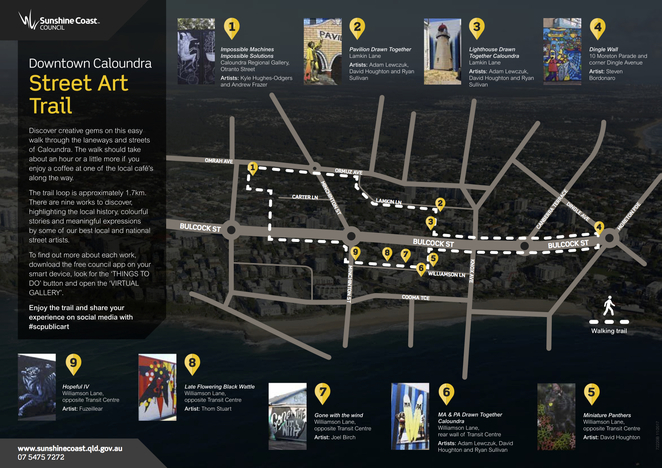 I am including the map supplied by the Sunshine Coast Council, which wasn't the easiest to follow, but with a bit of u-turning and to-and-fro-ing, we soon found all the artwork on the Downtown Caloundra Street Art Trail. All good things come to those who are patient. Here's a list of what you can look forward to when traversing downtown Caloundra, with street names and basic location - half the fun is finding them yourself! This public mural was created by internationally renowned artists from Western Australia, Andrew Frazer and Kyle Hughes-Odgers. Impossible Machines, Impossible Solutions portrays 'two different characters on a journey, making their way across the wall. It symbolises the connection and collaboration and a journey through life and whatever that means to each individual'. The heritage-listed Kings Beach Bathing Pavilion is playfully depicted in this unusual mural with a recycled photograph of a young lady in bathers, having been contemporised with splashes of fresh, neon colour. Whilst out and about walking and discovering, one must keep one's eyes peeled as there is artwork in the most unsuspecting of places. Next to the Pavilion mural, we discovered a brightly coloured Aboriginal mural with geometric patterned walls. The aquatic colour and the representation to water lends itself perfectly to Caloundra's coastal heritage. This mural in Lamkin Lane features Caloundra's oldest lighthouse, which was built in 1896. The heritage-listed Lighthouse perches on top of the ridge in Canberra Terrace and faces the shipping channel through Moreton Bay. The lighthouse mural is looked after by Friends of the Caloundra Lighthouse and the lighthouse is open to the public twice a month - look out for the flag flying and you will know the lighthouse is open. Located at the top end of Bulcock Street in Caloundra, a once unsightly, graffiti-covered wall has been transformed by Steven Bordonaro and Cassie Munson into a very impressive way-finding mural. These phenomenal artists have managed to capture all things Caloundra with the Dingle Wall mural, which has become a well-loved local icon. The inspiration for the Dingle Wall mural came from artist Steven Bordonaro's love of Caloundra and his wish to share the assets of the town of Caloundra with the local community and tourists. Steven and budding artist, Cassie Munson, brought colour and light to the wall in Dingle Avenue, successfully linking the past to the present. It has been created to be a 'happy' wall, bringing a smile to the faces of all who see it, and instilling pride in the community. A spectacularly colourful mural, the Dingle Wall is well worth a visit! As part of the partnership between Sunshine Coast Council and First Coat Toowoomba, local artists were selected to respond to a number of walls in Williamson Lane, Caloundra. 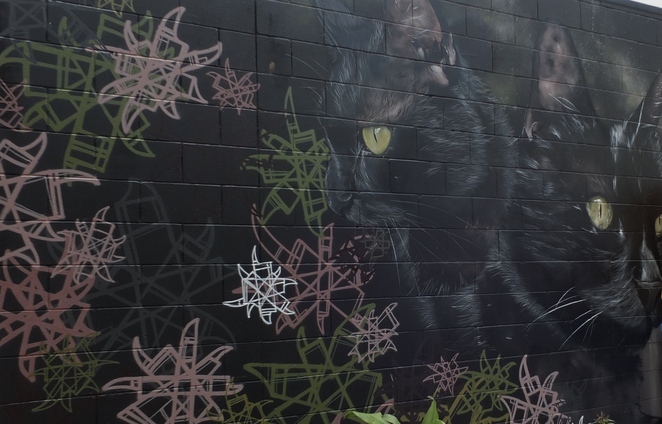 The artist, David Houghton, was inspired by the character of his own domestic cats and has managed to transform a very unappealing wall in Williamson Lane, into a truly magnificent piece of artwork. The Miniature Panthers were crafted as part of the 2016 Block Party. Marjorie and Charles Bendall were the oldest surfers catching waves from the early 1960's through to the 1970's. This Caloundra dynamic duo only started surfing at the age of 50 and 51, hence their nicknames, Ma and Pa. A long-standing surfing competition - the Pa and Ma Bendall Memorial surfing contest - is held annually around Easter time and is usually held at Moffat Beach, but location may vary due to wind and weather conditions. The mural in Williamson Lane is a fitting tribute to a husband and wife surfing team, who formed an integral part of Caloundra's surf culture for many years. The mural Gone with the Wind is artist Joel Birch's way of paying homage to his friend, Tom Searle, who passed away in 2016, sadly losing his battle with cancer. Tom wrote an album that was, in essence, his 'goodbye' with one of the tracks being titled 'Gone with the Wind'. Joel's artwork is a fitting response to Tom's memory and was created as a part of the First Coat Regional Activation Programme. 'The native wattle motif functions as an ode to a nostalgic 1970s Australian identity. In particular, Australiana, which can still be found in coastal Australian towns like Caloundra. While modern architecture and a new visual aesthetic has emerged, there is still an underlying tone of Ken Done, 70's hand painted signage, breeze bricks and Jenny Key prints around every corner. The repetition of angular shapes and circle motifs, acts almost like a wallpaper, to reflect the coast's story, both past and present. The warm, bright hues repeat this reference to place. Queensland's identity is full of surf and graffiti culture, whose colour palettes are in a constant state of colour clash to attract the most attention. 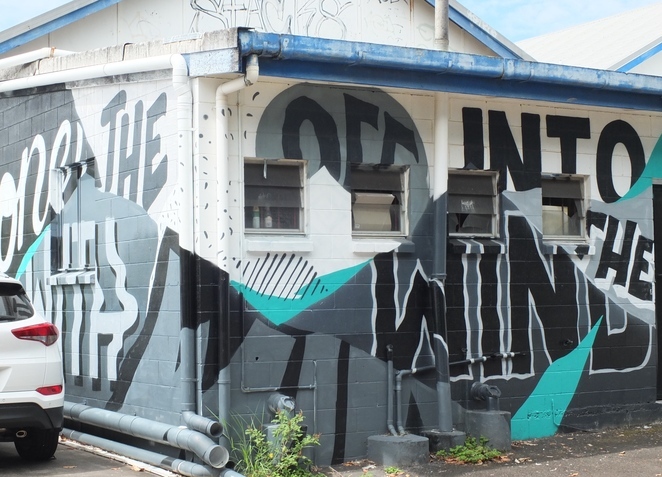 In response to Sunshine Coast Council and First Coat Toowoomba's selection to respond to a number of walls in Williamson Lane, artist Claire Matthews, aka Fuzeillear, responded with this reflective and enigmatic work. Keep on the look-out, you never know who might be around the next corner! To find out more about each of these works, download the free Council app onto your smart device, look for the 'THINGS TO DO' button and open the 'VIRTUAL GALLERY' - share your experience on social media with #scpublicart. Thanks to Sunshine Coast Council for the different interpretations on each mural. As previously mentioned, I am no art connoisseur. The huge attraction for me is being outdoors, exploring and being rewarded with some very fine art, lovingly created by local talented artists - proving that the Sunshine Coast is truly blessed with inspirational creatives. Do yourself a favour and bookmark Downtown Caloundra's Street Art Trail - it's treasure hunting at its best! And... it's totally FREE! Why? It's treasure hunting at its best, and it's totally FREE! Love street art and that Dingle Wall is mighty colourful. Nice article. That's a great find Elaine. I love things like this; they give a town so much life. Wow! Love the article Elaine. I’m no Art connoisseur either but loved so many of the works you featured, just for the history behind them and the amazing colours. Fantastic article and photos. excellent pictures Elaine. Thanks for sharing.